Windmills are everywhere nowadays. They’re all owned by big business, not the public who pay for them. What Is The Real Story Behind These Windmills? In the 1990s the World elite were starting off the great global warming fraud ( the Earth has now cooled for the last 16 years in a row ). The original idea behind the global warming fraud was a carbon tax. However with strong resistance to the carbon tax across the World, a new spin-off fraud was discovered – windmills. Windmills could be used to defraud billions of pounds from the taxpaying public by big business with the connivance of corrupt politicians. 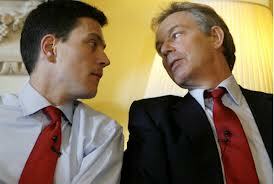 Blair and Miliband – New Labour were happy to help big business with the windmill rip off. They look environmentally friendly and get their pay offs later as consultancy fees. What Is The Pinko/Socialist Cover Story For Windmills? The cover story for the windmill rip off was too easy – that windmills produce “green” electricity which will save the planet by reducing carbon emissions. Anyone disputing this cover story can easily be attacked for not caring about the environment. 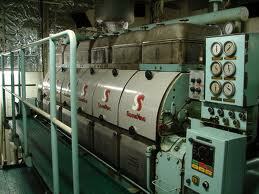 Any technical concerns can be dismissed as people not understanding the new green technology. 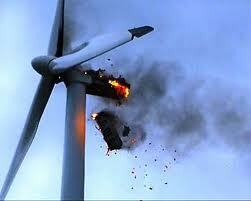 Windmills produce nothing when there’s no wind and have to be turned off in high wind to avoid this happening. So What Is Wrong With Windmills? It’s very simple really – sometimes there is no wind to turn the turbines and in high winds they have to be turned off . This means that there is no reliable source of energy for the Electrical National Grid, so we must always have spare capacity in the system. 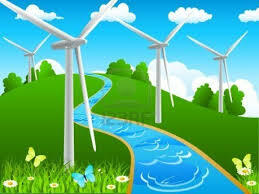 This means any electricity that is produced by the windmills isn’t used as it will always be surplus. If we ever did try to rely on the windmill power we would have rolling blackouts whenever the wind dropped – this happened in California several years ago when they tried. 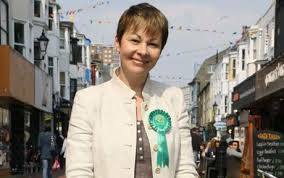 Caroline Lucas MP and her Green Party have supported the windmill rip off which will cost every household in the UK about £112 per year in 2013 and is set to rise. So If Windmills Only Produce Erratic Power How Do They Use It? The solution big business and their puppet politicians have come up with takes the windmill rip off to a new level of insanity. They’re going to install diesel generators in the base of windmills to ensure continuity of supply. Obviously the public will be paying big business to do this, plus a hefty profit for their shareholders. Are diesel generators, in remote fields below giant ornamental windmills, really good for the environment or just profitable for big business? So Who Are The Winners In The Windmill Rip Off? Big business and the banks are the obvious winners as usual. The corrupt politicians also make a large cut either as consultancy fees when they leave Government or through family and friends. One example is Conservative Party Leader David Cameron’s father-in-law, Sir Reginald Sheffield, who makes £650,000 every year leasing land out for windmills. Nick Clegg’s wife accepted a lucrative job with a major Spanish wind farm firm just weeks after her husband became Deputy Prime Minister – Miriam Clegg is joining the board of Acciona which has been awarded contracts in Britain. 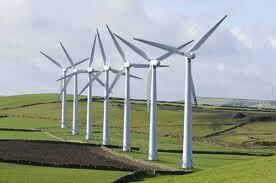 In 2008 then British Prime Minister Gordon Brown announced the UK would spend £100 billion on wind farms by 2020. Renewable UK are the main lobbying firm on behalf of the windmill rip off industry in Britain. 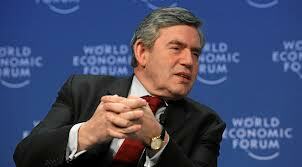 Gordon Brown – as usual he signed anything big business and the banks wanted. So is he corrupt or inadequate? Looks like both to me. So Who Are The Losers In The Windmill Rip Off? The British Public as usual – it costs us about £112 per household every year in 2013 and is set to rise. Also we have our Countryside covered in these monstrosities and the access roads needed for their high maintenance requirements. The Labour government introduced a consumer subsidy, added on to electricity bills, to encourage the construction of wind farms. 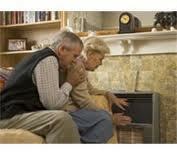 That subsidy is predicted to rise to £6 billion by 2020 – £400 for a family of four every year. As usual our corrupt politicians sold us out to big business and the banks. Could These Windmills Be Of Any Use? The only way to use power from windmills is for something like heating a swimming pool or large building – you use the erratic energy they produce backed up by conventionally produced power for heating. That way it doesn’t matter that some days they produce nothing at all. However this would still be very expensive energy. Also most windmills never recover the energy needed to design, build , install and service them over their lifetime so can never really be considered “green”. The windmill rip off has a great environmentally friendly cover story. Were There Any Other “Green” Polices We Could Have Implemented? Yes. Home insulation would have been a much better idea. In Scandanavia they build houses so well insulated that they can be lived in all year round with virtually no heating. Building houses to this insulation standard in Britain would only cost a couple of thousand pounds per house if implemented from the design stage, and would save hundreds every year in bills. Even insulating after building can be very effective – some houses in Salford were retro-fitted with high standard insulation leading to a 35 to 40% cut in heating fuel and bills. Also this would be genuinely environmentally friendly. 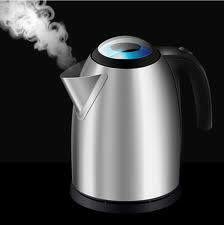 It takes about 3KW to boil a kettle. * minus figures are when the windmills drew more electricity out of the National Grid than they put in – this is when there is no wind and they are powered by electricity. 3KW is about enough to boil a kettle of water. These 7 windfarms had a net gain of 257KW between them – enough to boil approx 86 kettles of water. However none of this electricity will have been used as wind energy is always surplus by it’s nature. None of these 7 windfarms have had diesel generators fitted yet, but I will put the new figures up when they have. While the snapshot analysed shows how little electricity was produced by some wind farms on still, summer days, there have been other times in the past month when wind farm owners have been paid by the National Grid to shut down in order not to over load the electricity supply system. Such is the erratic nature of wind farms. 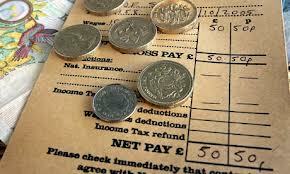 Such payments – known as constraint payments – have reached £7.5 million for the first three weeks of August 2013. By 2020 the Windmill Rip Off will cost a British family of 4 about £400 per year. Can you afford that? John Constable, director of Renewable Energy Foundation, a think tank which has been critical of wind farms, said: “Professional analysts have long known that fluctuating wind turbine output is poorly correlated with demand, but RWE’s new website is a very valuable addition to the data available to the general public, and will encourage informed debate about the relative potential for different renewable technologies. Even the wind power supporters calculate that a windmill takes 23 years to cover the CO2 needed in construction and maintenance. Windfarmaction has a horrifying picture of the foundations and base for a typical large turbine. 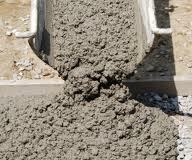 Apparently this consists of some 900 tons of concrete, which itself needs 126 tons of cement – 900 kg of CO2 are emitted for the fabrication of every ton of cement. This massive construction will be completely hidden from view when the turbine is operational, and won’t be removed at decommissioning, either. This entry was posted in Bilderberg Group, Corruption, Crime, Finance, Globalisation, Government, Labour, New Labour, Police, Politics, Zionism. Bookmark the permalink. If you use less power, due to insulation or low power devices the electricity and or gas companies will be obliged to rise the prices of their products in order to maintain their profit margin. Forcing the consumer to pay more for less or find a way of using less. If people use less power the price goes up again to again maintain the profit margin of the big business. QED The consumer will always pay more! “support,” mid-15c., from Middle Dutch proppe “vine prop, support,” of unknown origin. Probably related to Old High German pfropfo, German pfropfen “to prop,” perhaps from Latin propago “a set, layer of a plant” (see propagation). Note the link between Brown’s “Green shoots” and plants/vine above! “Legend has it that St. Mary Magdalen went to Rome and met with the Emperor Tiberius to tell him about the Resurrection of Jesus. She held out an egg to him as a symbol of this, and he scoffed, saying that a man could no more rise from the dead than that egg that she held could turn scarlet. The egg turned deep red in her hands, and this is the origin of Easter eggs, and the reason why Mary Magdalen is often portrayed holding a scarlet egg. Anyone for Salmon-ella egg sandwich? I read about 2/3 of this by which time I was too frustrated to continue, as it is clear that the author has no intention of giving an even-handed presentation and is just trying to push an agenda. For example, one section is entitled ‘how they performed’, implying a sort of long term assessment of wind generation performance, only to take a snapshot from the worst time on the worst day in recent history. This article is light on facts and extremely heavy on bias.